My summer project in 2014 was putting together a collection of poetry and photographs. 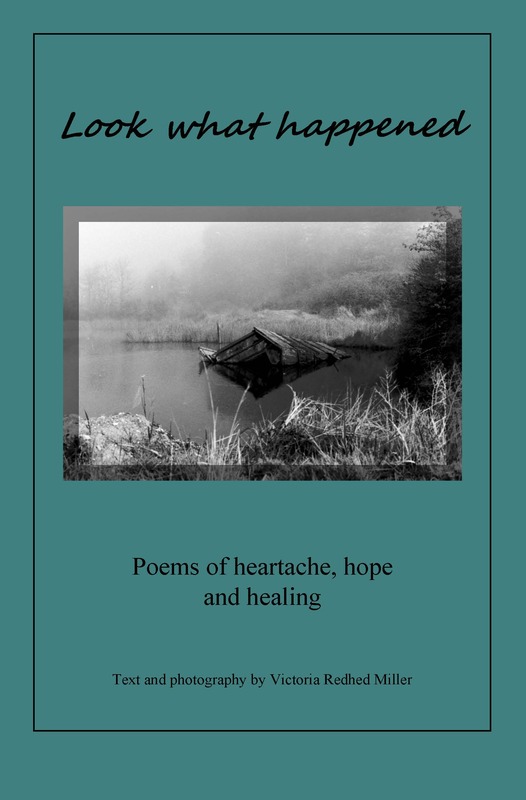 Some of the poems, and almost all the photos, date from years ago; other poems were written during the three weeks I spent compiling the collection. “Look what happened” is a 52-page collection exploring the depths of pain and the process of moving through heartache toward healing. In my case, I was dealing with a life-threatening illness. It doesn’t matter which illness, so I did not specify it here. My feeling is that pain is pain and heartache is heartache. Circumstances vary, but certain emotions are common to us all when we experience devastating loss, betrayal, abuse, illness, or whatever your particular story involves. Whatever you are going through is unique, and I would not minimize your experience by comparing it to mine. I do believe that at some point we have to have a reason to hope for something to change for the better, and that is the message I endeavor to convey with this collection. If you are interested in purchasing a copy of this book, please use the contact form to get hold of me to request one. The price is $12 and includes shipping in the continental United States. I will arrange shipment and payment via check, money order or PayPal. In the meantime, I wish you peace and a good night’s rest tonight.